Mewtwo x Akira! Pokemon One a Day! 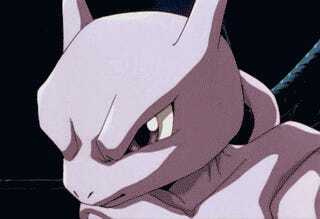 To me, Mewtwo is one of the most important Pokemon of the entire franchise, and one of my all time favorites. 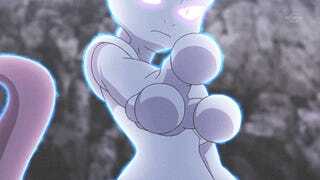 Mewtwo and his status in the first games and animated media represents the darker side of the lore, and to me is one of the staples of the legendary tier. Mewtwo always gave off an "Akira" vibe, right? Tetsuo and company may have inspired his story and and backdrop. I find Mewtwo to be so unique in that it is truly one of a kind - His story revolves around ethics and morality, and would be considered an abomination due to his ill conceived creation. 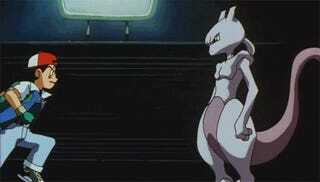 Mewtwo is so perfectly flawed. That, and he's one of the strongest motherfrackers in the realm of the universe. 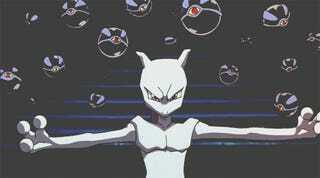 Mewtwo and the psychic type relinquish in the fact that they can defeat their foes without brawn or muscle, but with intelligence and their telekinetic gifts. 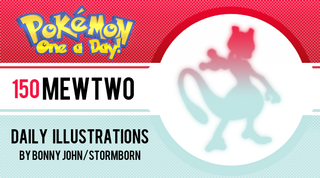 The awe inspiring power of Mewtwo is the visual I want to present with today's illustration. With yesterday's piece paying homage to the TV series, Mewtwo today is drawn with a nod to its creation as explored in the first film. I knew I wanted to have a picture of Mewtwo in its "womb" as its such an integral part to his character - this is the moment where Mewtwo breaks the chains and curses humanity. In this piece, I have brought Mewtwo front and center and used the One a Day frame to my advantage to create a sort of 3D effect; glass and shrapnel are sent flying, and smaller bits like embers and smoke leave the canvas. Originally, I was planning to have the frame "break" along the test tube glass. This ended up looking a bit off and instead, I opted to focus on creating a detailed and frenzied piece. With all the crazy action around Mewtwo, the legendary Pokemon is seen front and center in a very poised manner - such is the nature of the Psychic type. Mewtwo will exact revenge, just so long as he - wait, is that Giovanni attempting to use a Masterball to catch the genetic Pokemon? The never fail capture device is split in two immediately. I always found it silly that Mewtwo and other legendaries could be captured by such an instrument...I thought to add it in as a message that this Pokemon is simply too strong to be victim to it. The unnattainable creature destroys the Masterball and will soon empty the facilities of the scientists that created it. The split Masterball is brought to the foreground and frames Mewtwo in the center. The irony here is that Mewtwo is enclosed by it in this 2D visual plane in a way while the Masterball should have captured and contained the creature inside of it by way of traditional lore. Not this time! Because the work has such a sci-fi feel to it, I decided to go with a sort of comic-booky type feel. Black outlines are used sparingly to help flatten areas amidst detailed ones. There's a lot going on in this work visually and I hope the overwhelming nature of the action is enjoyable to you. I had a blast working on this piece even if it provided a major headache in figuring things out visually and composition wise. It's largely due to the fact that I simply love this Pokemon and what it brings to the series. So there you have it! Mewtwo is complete, and we have...dare I say it...ONLY ONE MORE POKEMON TO GO! That is insane...And speaking of which, Mew, which I have been working on over the weekend with Dragonite and Mewtwo, has been driving me insane. I hope to get it done in time. In fact, I shall take my leave now to get cracking! Thanks guys and gals for checking out the one and only Mewtwo. Love and peace and good night!